Simon Holloway sent several photos from the lives of Wilfred and Evelyn Chapple of Walnut Tree Road, Brentford. 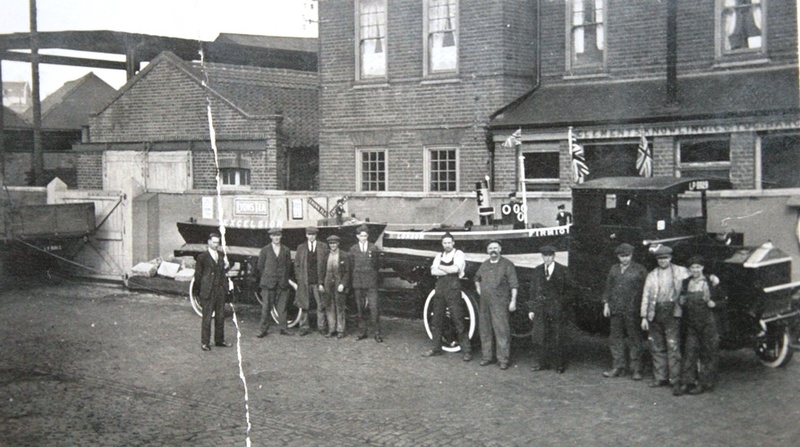 This photo (original is sepia) was taken in 1932 outside Clements Knowling offices in Ferry Lane and shows a group of 11 men, mostly in workmen's clothes, in front of a lorry loaded with two boats. Wilfred Chapple worked as a steam crane driver for Clements Knowling on the docks- as did his father Wilfred K. Chapple. The two boats are around 10' - 12' long, the 'Excelsior' has several adverts for Lyons Tea, the other, with a funnel, is a model with names 'London' and FIRMIO...' . The funnel has the Clements Knowling monogram 'JC'. Flags decorate the lorry, this may be a float for the Empire Day parade? The London Lighterage Tugs website at http://www.lighteragetugs.co.uk/index.php includes reference to an 'Excelsior' launched in 1891, owned by George Knowling, Kew Bridge and James Clements, Brentford, scrapped in 1915, it was over 55' long. The London Lighterage Tugs website also includes photos and details of other CK tugs. In January 2017 Hugh Hughes wrote 'I believe the man in overall flat cap and a mastache is my wife's Grandfather Robert Gent; he lived in Braemar Road'. He is the seventh from the left in the photo below. Hugh also provided another photo showing Robert Gent, most probably taken at the same time. You can also search on the Home page for other references to James Clements and George Knowling on this site.